It’s been pretty quiet around here as I’ve been stitching away on my last Harry Potter sampler cross stitch, whilst starting work on Coco’s nursery! The first project that I’ve completed is painting Coco’s cot / crib that was kindly given to us from a family member who no longer needs it. 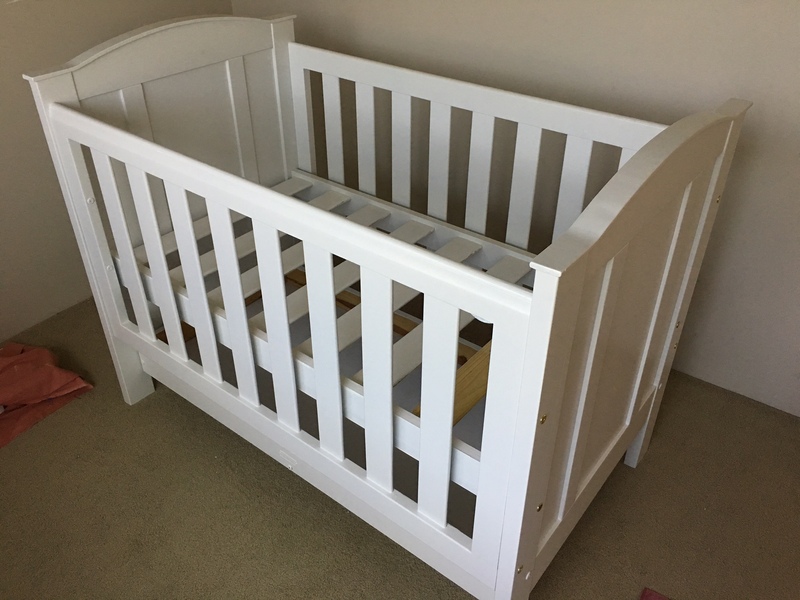 It’s a very sturdy cot that meets all Australian standards; the original colour was a brown timber. It would look great in a nursery, but didn’t suit our gender neutral colour scheme (more to come on that later!). I decided to paint the cot white to suit our theme so got busy with planning paint types etc. One of the first questions I asked myself was, ‘what will be the safest paint to use for children’s furniture?’ I originally thought water based, as I know Coco will likely end up chewing on the rail edges. After a fair bit of research, speaking with friends and family, and speaking with paint specialists, it turns out oil based was by far the paint that most people recommended; it is less likely to flake if chipped, which is definitely a plus in my book. Lots of people online have painted their second hand cots so there’s heaps of instructions available, but just about every person’s blog or instruction that I read suggested sanding the cot first. I was amazed – no way was I going to sand this whole cot down! Instead, I used the 3 in 1 primer & sealer I used for our DIY bar many moons ago; thankfully I still had about half a tin left and it was still in good knick. This meant rather than sanding the cot, I was able to just paint the primer & sealer onto the cot to provide a gritty surface for the final paint colour to adhere to. The other bonus of using this primer & sealer is only ONE coat is required – a definite time saver! Painting the primer & sealer took about 2 days. I painted one side of all cot pieces first, allowed to dry, and then flipped and turned them to paint the other side. I used about 1L of primer & sealer for the first coat. Once that dried, it was onto the first coat of paint colour. 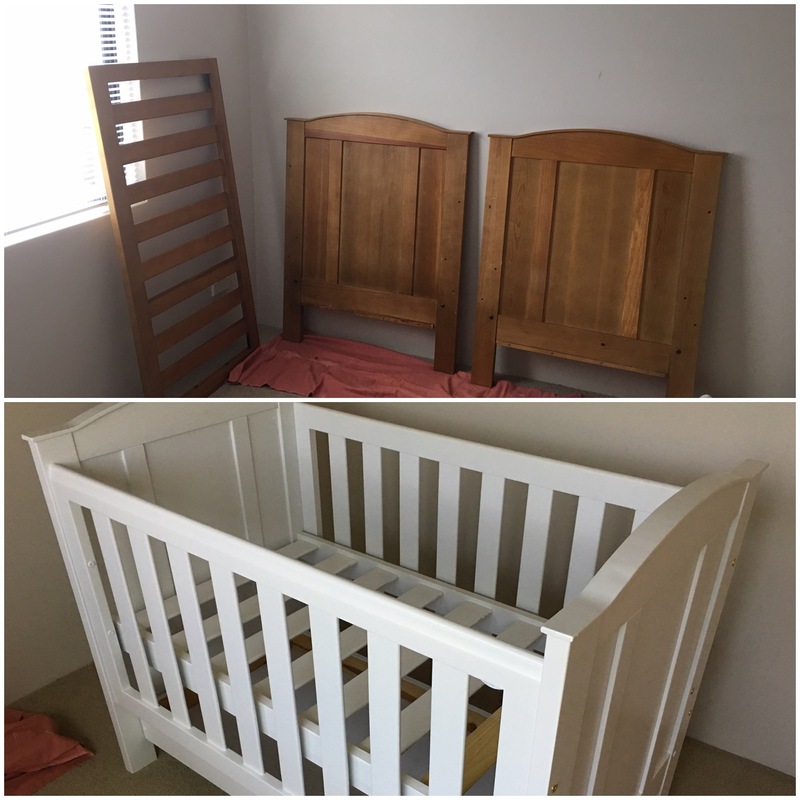 The paint specialist I spoke to advise a pure white oil based paint tends to yellow over time – Mr A and I plan on using the same cot for other kids (assuming we have them), so yellowed paint didn’t appeal to me. I ended up picking Infinity White by British Paints as the cot colour; it basically looks white but is slightly tinted grey which should prevent the paint from yellowing over time. I painted the first coat in the same way; paint one side, let dry, and then flip and turn so all other sides / surfaces are painted. It was quite hard to try and keep brush marks whilst painting with the oil based paint. I made sure to do long lines with the brush to prevent too many marks, but quite honestly, brush marks whilst painting with a brush are pretty inevitable really! Each side took me about an hour, to an hour and a half to paint, so not too long really. The main thing was making sure I didn’t drip the paint on either side, which was actually quite hard. Mr A ended up sanding out a couple of spots for me once each side of the first coat was painted, as I’d accidentally dripped on one side by loading up the paint brush too much. I painted a second coat on each side of the cot which really covered the brush marks. Here’s what the finished cot looks like! It was well worth the 6 hours it took to complete this project. If you have any questions on what I did, feel free to drop me a line! I’d be more than happy to help. And yes, for those of you with a keen eye, 1 rail in the mattress frame has been left the original pine colour, as there’s instructions on how to fit everything which I didn’t want to paint over in case we sell it or something. Thank you – well worth the effort for the end result I think! Hopefully the tint of grey ensures it doesn’t yellow over time. Love the updated white crib! Thank you! :) We are very excited. It’s definitely a bit of a revamp for the crib.